Well, it’s not far off, is it? And you might already be thinking about all the decorating you would like to achieve in 2015, after the frenzy of Christmas is over. But in the next breath, you might be thinking, I can’t afford it right away. I’ll still be paying for all those mince pies. 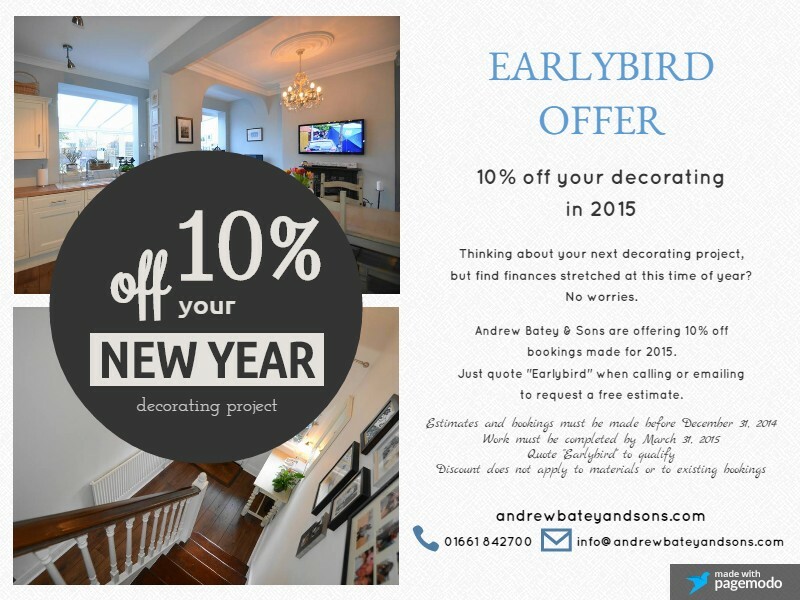 So, at Andrew Batey and Sons we’re offering 10% off up until the end of March 2015. Just quote “earlybird” when you call or email to request a free estimate. Bookings and estimates must be finalised by the end of December 2014, and the projects must be completed by March 31, 2015. The discount does not apply to materials or existing bookings. This entry was posted in News and tagged andrew batey and sons, Decorating services Hexham, decorator in stocksfield, Decorators in Northumberland, painter decorator corbridge, painter decorator stocksfield.